Railroads changed agriculture. As railways linked farms to a wider commercial world, farmers began to grow new crops for markets near and far. Vast wheat fields supplied flour for people around the world. Trains carried cattle and hogs to central stockyards and shipped meat by refrigerated railcars to retail markets across the country. City dwellers could buy fruits and vegetables year-round. Farms became commercialized, often specializing in single crops and became tied to the ups and downs of a national market. With its rich farmland, Watsonville became a center of produce farming. When the railway opened up new markets, local farmers began to experiment with sugar beets, apples, strawberries, and other cash crops. These new crops were highly labor-intensive, needing a vast army of workers to plant, cultivate, harvest, and pack them. Watsonville growers looked for low cost and temporary field hands. They hired Chinese, Japanese, Filipino, Mexican workers to perform the backbreaking work. 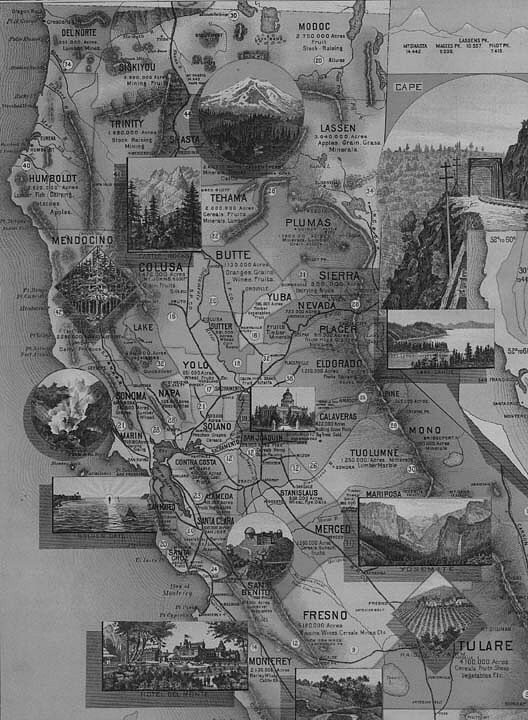 "The Unique Map of California," by E. McD. Johnston, 1888. Dickman-Jones Co., lithographers. Specialty crops require a lot of labor. California growers hired large numbers of ethnic laborers to plant, cultivate, pick, and pack their crops. Watsonville farmers employed Chinese men to work the land until Congress passed the Chinese Exclusion Act (1882), which stopped these laborers from immigrating to the US. Growers then brought in Japanese workers. By 1900 Watsonville counted 400 Japanese among its few thousand residents. In the 1920s, when Japanese immigration was restricted, Watsonville agriculturalists became more dependent on Filipino and Mexican workers. With each new round of hiring, growers helped change the ethnic composition of central California. Chinese who lived and worked in communities along the central coast of California in the late 1800s used these everyday domestic items. After the Chinese Exclusion Act of 1882, Chinese immigration slowed to a trickle. By the 1890s, California’s overwhelmingly male Chinese population was aging and declining in numbers. Growers began to look for other sources of cheap labor. Young male Japanese immigrants replaced older Chinese laborers in the orchards and fields. Although Japanese men began their American lives as hired laborers, some eventually became small farmers. Many formed families, since a loophole in immigration law allowed Japanese women to enter the country to join their husbands. But in 1924 the National Origins Act barred all Japanese immigration, cutting off this source of farm labor. After the United States restricted Japanese immigration, California agriculturists hired men from the US colony of the Philippines to help fill their labor needs. By the late 1920s, Filipinos were the Pajaro Valley’s dominant labor group. In 1934, this migrant group was also legally restricted from entering the country, like the Chinese and Japanese before them. Mexican farm laborers had always worked in Watsonville’s fields, but they became an increasingly important source of labor after the 1920s. In 1942, the federally sponsored Bracero program encouraged Mexican nationals to work in the United States on a temporary basis. By the time the program ended in 1964, Mexicans had become the dominant source of farm labor in the Watsonville region. What Happened to Farm Work? Today—just as in 1890—Watsonville, California, is a center of agricultural production and heavily dependent on low-paid immigrant workers. But Watsonville now grows different crops and different people work the fields. Agriculture remains a mainstay of California’s economy and continues to be highly commercialized. The orchards and sugar beet fields of the late 19th century gave way in the 20th century to truck crops such as lettuce and broccoli. After World War II, Watsonville became a frozen-food processing center, although in recent years these factories have moved overseas. Workers picking strawberries, Pajaro Valley, California, 1980s. Watsonville’s population has also changed. Although Watsonville is home to Anglo, Japanese, Chinese, and Filipino families, 70 percent of the population is now Latino and one-third of its residents are immigrants. Latinos began coming to Watsonville in the 1920s. During World War II, the Bracero program, which allowed Mexicans to enter the country on short-term labor contracts, helped expand the population. Since 1965, when immigration laws changed, Watsonville’s Latino population has continued to grow. Heavily involved in farm labor—doing over 90 percent of the work in 2000—Latinos in Watsonville today provide most of the region’s low-cost laborers. Railroad companies laid more than 100,000 miles of new track between 1870 and 1890. Along with the development of refrigerated cars, this new network helped create a growing market for fruit and other produce. By the 1880s, Armour, Swift, and other meatpacking companies shipped refrigerated beef around the country. Fruits and vegetables became more widely available. Strawberries from Tennessee, Georgia peaches, Florida oranges, and a cornucopia of produce from California poured into midwestern and eastern cities, feeding America’s expanding urban populations. With new national markets beckoning, Watsonville farmers tried out new cash crops. 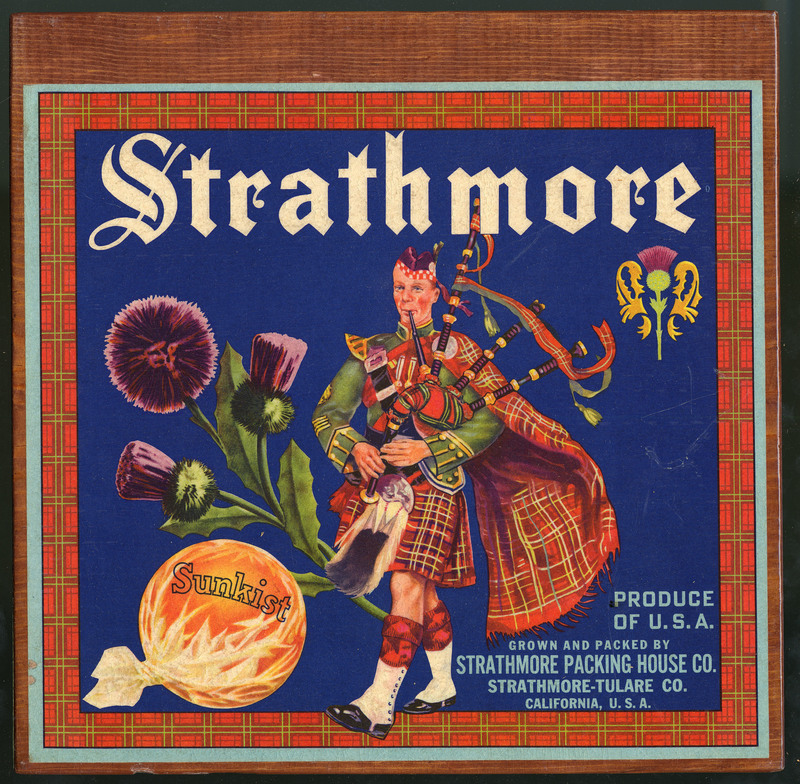 In the 1870s and 1880s, they experimented with strawberries, hops, loganberries, apples, and other fruits and vegetables. Watsonville sent thousands of tons of strawberries to San Francisco, and sold its apples nationally and internationally. In the 1890s, Pajaro Valley farmers planted even more orchards, growing strawberries and other cash crops between the rows of trees to bring in money while the orchards matured. 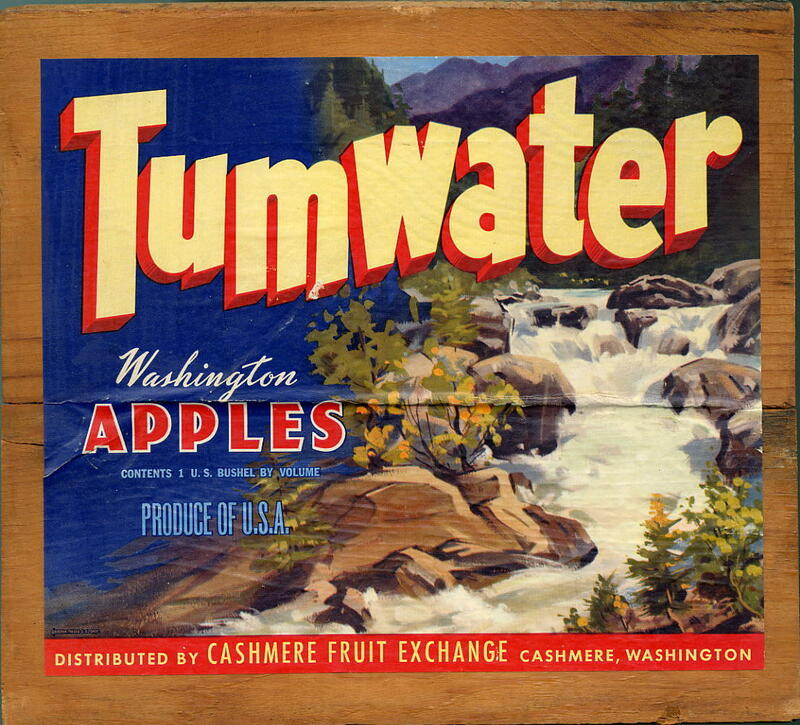 As more fresh and canned produce was shipped around the country, growers began to label their wares. These labels helped the shippers keep track of which box of fruit belonged to which company. They also helped create brand recognition. Fresh vegetables, fruit, and meat had to be kept cool to be shipped long distances. Refrigerator cars began running in the late 1860s, using blocks of ice in special bunkers and air circulation to preserve their perishable cargoes. By the 1880s in California, ice was cut in winter from lakes in the Sierra Mountains and transported by rail to icehouses located in every farming region—including Watsonville—that shipped vegetables or orchard crops. Refrigerator cars received fresh ice at such houses, which stored their ice supplies in layers of straw to last into summer. 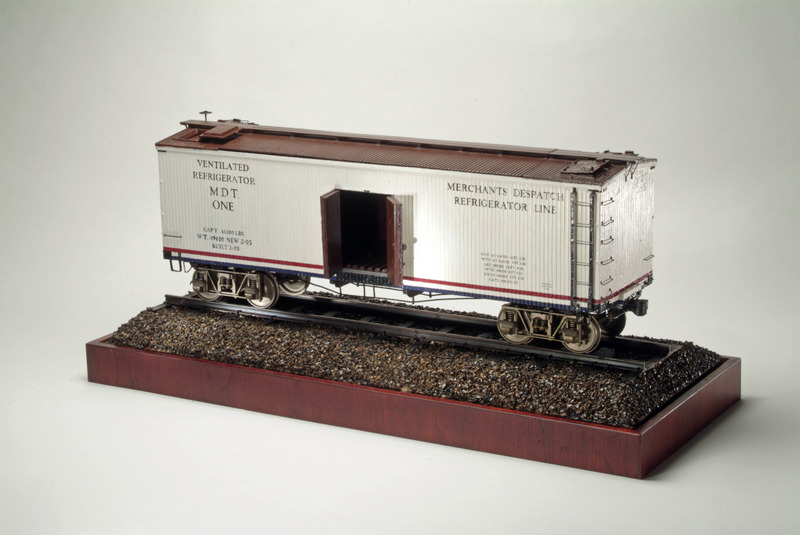 This model shows a car built in 1905 for Merchants Despatch Transportation, an eastern firm that operated several thousand refrigerator cars nationwide. Beginning in 1888, Watsonville farmers grew sugar beets for a local factory, which was the largest beet processing plant in the country. By 1895, they grew beets on 7,244 acres of land. This crop helped protect Watsonville from the depressions of the 1890s and firmly tied local residents into commercialized farming. But in 1898, because beet sugar production shifted to the Salinas Valley, the factory moved too. The Watsonville factory closed after only 10 years of operation.